"Despite the fact that our modern mass media makes it appear that atheism and secularism are on the rise in the world, in fact the opposite is true. Despite the fact that our media constantly insists that Darwinian Evolution has been proven to be true, in fact the scientific evidence against it is growing by the day. Despite the fact that our media continually highlights the idea that the Bible is an outmoded book full of myths and fairy tales, in fact historical and archaeological research is revealing that the Biblical manuscripts are exactingly accurate in every detail." Subtitle: "A Handbook for Separating Fact from Fiction in a Propaganda-Filled World"
The first thing I noticed is that this book is an easy read. It is 172 pages, followed by end notes, a glossary and a section of recommended reading. Also, the text size was large enough to please me. Another reason it is an easy read is that the author does not act like certain authors by attempting to impress you with sesquipedalian erudition; he talks to you. Yes, he has quite a bit of "book learning", and he refers to his source material, but without pomposity or making your brain hurt. 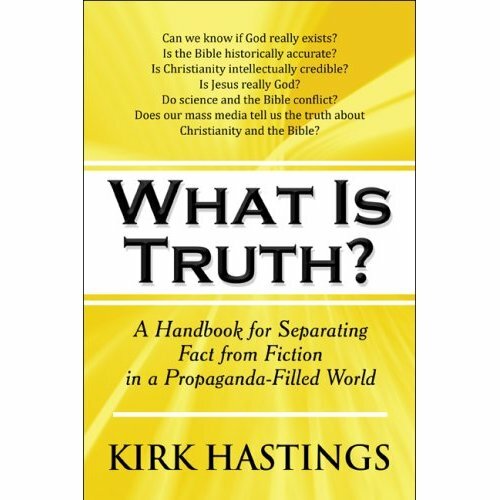 Like many people, Kirk Hastings did not have a working knowledge of Christian truth in his younger years. His mother was a believer and his father was not, and church-going was not allowed. He had no significant spiritual influence in his life, and "religion" was a foreign concept to him that did not merit much thought. When his mother contracted terminal cancer when she was only forty six, he prayed to God to heal her, but to no avail. He was emotionally devastated, and assumed that God must not exist. "After all, if he existed he would have heard my prayer and at least made some attempt to help me. But he didn't. So, he must not be real" (p.7). Several years later when he was twenty four, a waitress started asking him questions about his view of the Bible and Jesus Christ. This led to her inviting him to a Bible study. His preconceptions of the way "religious" people looked and acted were shattered. Kirk was invited to lunch the next day with the study leader. After lunch, he started with the usual "How do you know?" questions. And he received answers. Real ones, not the "you just have to believe" nonsense that he was expecting to be told. Shortly after this, he became a Christian. "Since that day (during the early summer of 1976), I have continued to diligently study the world's religions and the Bible, and to seek solid, rational answers to the hard questions of life" (p.11). What Is Truth? is the result. There are some things in this book that I would have changed. But, he didn't ask me! (Why should he?) I would have been a nuisance, interrupting his work and saying, "What about this? You can add that! Here's the other thing!" and made the book excessively long. Readers should be thankful that he did not know me yet. The book begins with a very basic lesson in the nature of logic. From there, he discusses the two main theories on the origin of life. This goes through cosmology, the two basic kinds of evolution, what is found in the fossil record, problems with Darwinian evolution, indications from microbiology, discussing if concept of Intelligent Design is scientific, and then the philosophical nature of evolution. From there, the book evolved (heh!) into evidences for the reliability of the Bible, the historical facts about Jesus Christ and about non-Biblical religions. At this point, Mr. Hastings begins to bring up some strong points about propaganda in modern society. (I have a small quibble with him that he only referenced Nazi propaganda techniques, and thought it would have been even stronger if he had included some information on Soviet-era propaganda, and the propaganda techniques of certain American political parties.) Movie makers were less inclined to offer entertainment, and were increasingly interested in using their medium as a means of presenting their messages. One notable example of this was the horrendous rewrite of the events of the Scopes "Monkey" Trial; "Inherit the Wind" had almost no truth in it, but the movie (and play) colored the perceptions of the public about people who believe the Bible over "science" that linger today. The final chapter contains further discussion about propaganda today. There are a few minor flaws in the book, some wording and typographical errors, but I suspect that Publish America did not use editors very well. I recommend What Is Truth? as an introduction to the issues and questions mentioned above. Kirk Hastings recommends many other books for people who want to do further research. Also, Kirk does not preach at you. He simply tells you about his questions, the answers he found and the reasons he has for his beliefs. Most importantly, to me, is that he encourages the readers to think for themselves. It is not all that difficult to think objectively and examine the facts if people are willing to follow where the evidence leads. What Is Truth? would be a good gift for someone (including to yourself) that wants a springboard for examining the deeper issues of life. Kirk can be heard on the radio show and podcasts from Evidence4Faith with Keith Kendrix.